Cotswold Museums - From Roman Museums to Motoring and everything in between! Mention Cotswolds museums and you must mention The Corinium Museum in Cirencester. 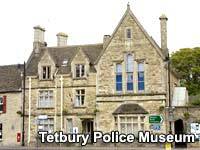 But there are many more museums to be found in the Cotswolds. Here we have a selection of the best. Visitors can trace the story of the Cotswolds from Prehistory to the late 19th Century, with hands-on exhibits, interactive displays and a wealth of precious artefacts. There are animated and practical games, and audio-visual screens to bring the past to life for everyone from schoolchildren to grandparents. Special emphasis is placed on the town’s Roman heritage, reflecting Cirencester’s importance as the second biggest Roman town, Corinium, outside London. The Roman collection is now spread over two floors and includes marvellous mosaics, tombstones and sculpture as well as room and shop reconstructions and objects from everyday Roman life. A dramatic new Anglo-Saxon gallery has been created to house the finds – including rare gold pendants - from the cemetery uncovered at Butler’s Field, Lechlade, in 1985. Here, visitors will come face to face with their ancestors in the shape of a forensically-reconstructed Anglo-Saxon man and child who were among the 219 bodies. The centrepiece of this new gallery is the reconstruction of the grave of ‘Mrs Getty’, the 6th Century Anglo-Saxon princess so nicknamed because of the 500 treasures buried with her. As well as new galleries and exhibits, the museum also has a re-designed entrance and reception area, a new, bigger shop and a fully-equipped Lifelong Learning Centre for school use, talks, seminars, lectures and community functions. 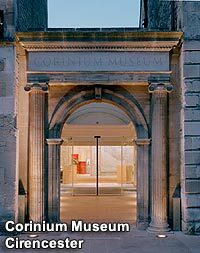 For more details about the Corinium Museum in Cirencester, see our Corinium Museum page. 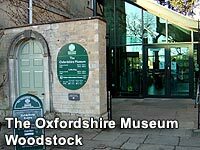 The Oxfordshire Museum in the lovely market town of Woodstock is a hidden gem that is well worth a visit. The Oxfordshire Museum is set out with displays over three floors of the historic Fletcher's House building (a 16th century merchant's house). The exhibits in the Oxfordshire Museum illustrate a wealth of local history and many interactive exhibitions give you a hands-on experience. There is a cafe on-site and a walled garden area at the rear with seating. Entrance to the Oxfordshire Museum is free. Please phone the Museum on +44 (0)1993 811456 to confirm current opening times. Housed in the Tudor Market/Court House, the wide-ranging collection illustrates Burford’s social and working culture, including the Town maces, seals and charters. An award winning museum hosting one of the UK's best collections of cars, motorcycles, toys and motoring signs. A privately run museum containing a dazzling collection of artefacts from all over the world, covering the history of the game of cricket and providing some revealing insights about some of its most illustrious players. 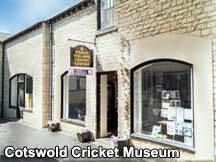 The Cotswold Cricket Museum is open Bank Holiday Mondays. A small independent museum dedicated to all those who served or who passed through RAF Moreton-in-Marsh.